Jurassic World director Colin Trevorrow dropped a nice holiday gift on Twitter today: the first footage of the sequel Jurassic World: Fallen Kingdom. 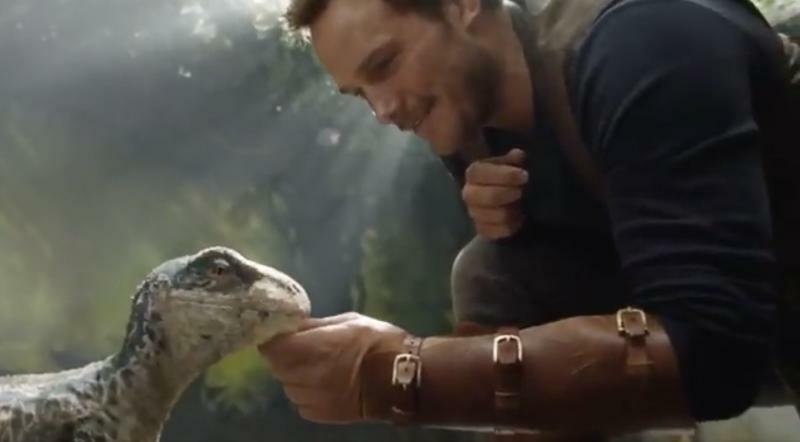 In the dino-dorable clip, raptor trainer Owen (Chris Pratt) gets a nuzzle from a tiny raptor that strongly resembles his right-hand reptile Blue. Watch the six-second clip below. Directed by J.A. Bayona, Fallen Kingdom takes place after the events of 2015’s Jurassic World, which made more than $1.5 billion worldwide. Trevorrow is co-writing and producing the sequel but has been cagey about the plot. “The dinosaurs will be a parable of the treatment animals receive today: the abuse, medical experimentation, pets, having wild animals in zoos like prisons, the use the military has made of them, animals as weapons,” he said at a film festival in Spain (via EW). In March, Bayona shared this film still of a child looking at dinosaur skeletons. In July, Trevorrow shared a photo of Bayona on set with a mystery dino in the foreground. There’s also a teaser poster, which calls back to a line spoken by Dr. Ian Malcolm (Jeff Goldblum) in 1993’s Jurassic Park: “Life finds a way.” Goldblum is set to reprise his chaos-theorist character (who also appeared in 1997’s Jurassic Park sequel The Lost World) in Fallen Kingdom. In addition to Pratt, Jurassic World stars Bryce Dallas Howard, and B.D. Wong will return for the sequel.